The WebMag Blogger Template is a robust and multi-purpose magazine theme for Blogger enabled websites. It is extremely efficient and has some highly customized functionality. Featured Slider: Featured content sliders are becoming a basic need of a website. Therefore, we have incorporated a light-weight slider so that it gives an attractive touch to your site without slowing it down. Featured Posts: We have also connected a featured post gadget which would fetch your posts from a specific label, and will display them on your homepage. However, the latest posts would continue to display beneath them. Mega Sticky Navigation Bar: This theme also has a built-in sticky navbar that floats when you scroll up or down the page. It has a lot of options Like Search pop-out and Social media lazy buttons. Social Sharing buttons: This theme is also equipped with social sharing buttons including Facebook, Twitter, Google+ and Stumbleupon so that your users can socialize your content with just few clicks. More Features: Magazine Style, orange color scheme, threaded commenting system, 2 column template, 2 column sidebar and much more. 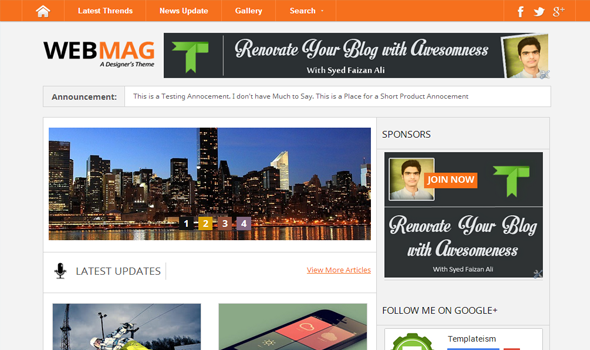 We hope this template would help you in renovating your blogger blog with awesomeness. We have tried to incorporate all those plugins and gadgets which are considered as the basic needs of a blog. However, you can also customize it according to your desired needs. We have to say, this is the most beautiful theme we have created till date.